Home › Blogs › Stories & Adventures › Seven Steps to Sidesaddle Success! 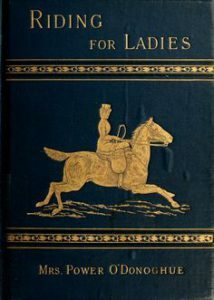 Seven Steps to Sidesaddle Success! Almost a year ago, I set out on a journey to learn how to ride sidesaddle, as my horse gets bored quickly and thrives on new challenges (as long as the question is more mental than physical). If he were a human, he would enjoy a Rubik’s Cube, sudoku puzzles, or a smartphone game like Angry Birds. Forget HIIT, Insanity, and CrossFit workouts. Little did I know how intellectually stimulating – as well as physically demanding — riding astride would be for us both! Some naturally talented people can just decide one day they’re going to do something and do it. I am not one of those people. So for me to succeed in this new discipline, I knew it was critical to receive professional instruction. Luckily, there was an American Sidesaddle Association-certified instructor right in my area! 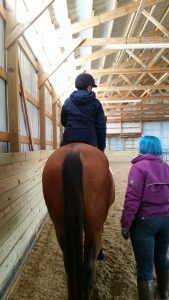 Diana began coming to my barn in February of 2018 and because she and I are roughly the same size–and our horses are roughly the same size–her personal sidesaddle fit both me and my horse well enough to get started (yes, she has blue hair). A sidesaddle must fit both the rider and the horse impeccably – there’s less “wiggle room” literally and figuratively in an aside saddle vs an astride saddle. 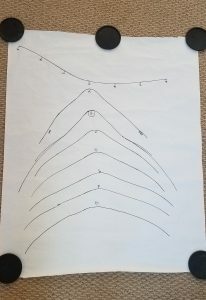 With Diana’s help, I made a back tracing (not just a wither tracing) of Newman, transferred it to cardboard, included my measurements, and mailed them to two different reputable sidesaddle consignment shops. Amazingly, one immediately matched it to a 1910 professionally restored Champion & Wilton in her inventory and with just a little bit of reflocking, it fits both of us perfectly! As my instructor, Diana focused mainly on my seat and posture and let me figure out the “language” with Newman, but she did have this handy tip when we had difficulty with the leg yield left: Use your body as if you still had a right leg on the right side of your horse. 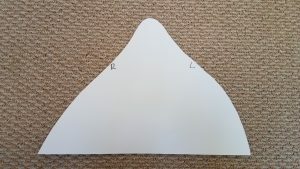 By imagining I still had a right leg which engaged my core, hip, and seat bone, this advice not only helped me cause Newman to move sideways left, but also to step deeply into corners and to bend right! 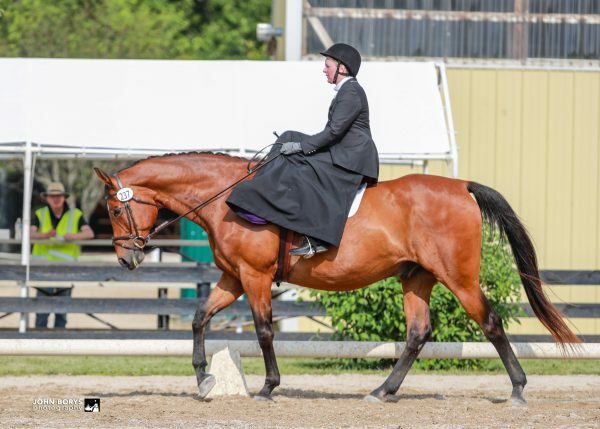 I immersed myself in the sidesaddle culture by reading books, attending clinics, joining facebook groups, and becoming a member of the American Sidesaddle Association as well as my regional club, Northern Illinois Sidesaddle or NILS. This book is priceless! Things were going well so I began to put together an outfit for competition. 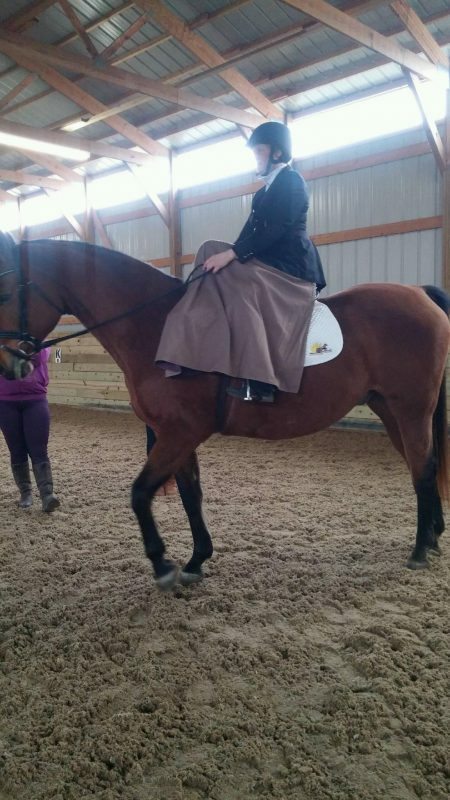 Fortunately my instructor is the same size as me so I was able to try out a brown plaid skirt she had, although I eventually went with black as we all thought it looked more elegant with my regular black show coat. I also had to decide on what kind and color breeches to wear underneath; what show shirt, stock tie, and pin; and gloves, whip, and helmet. Most challenging was leg/foot wear, as the position doesn’t really lend itself to a tall boot. Since it was Training Level, I knew I would be within the rules wearing black half chaps and black paddock boots. An extra long baby pad to fit under the extra long sidesaddle and a brown bridle and reins completed the ensemble. 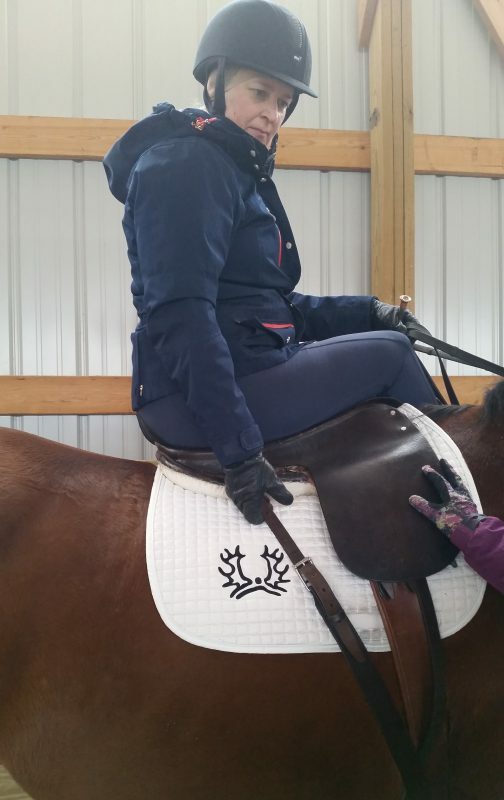 I still need one more score from a Third Level freestyle to earn my USDF Bronze Bar, which was also a 2018 goal, but it was hard to find the time to practice both aside and astride riding and I chose sidesaddle. Also, rules prohibit competing more than one level apart so I wouldn’t be able to show sidesaddle at Training Level and astride at Third Level on the same weekend. So I took this opportunity to compete in Dressage Seat Equitation, earning five scores above 72% for my Accomplished Level award! Step 7: Think positive and set the next goal! The first show, in May, was a real nail-biter, because our transitions weren’t confirmed yet (as in, I couldn’t be sure they would actually HAPPEN let alone happen at a letter). Also, sometimes steering didn’t always go as planned. But our first trip out we earned a very respectable 67% with a 7.0 for Rider’s Position and Seat. 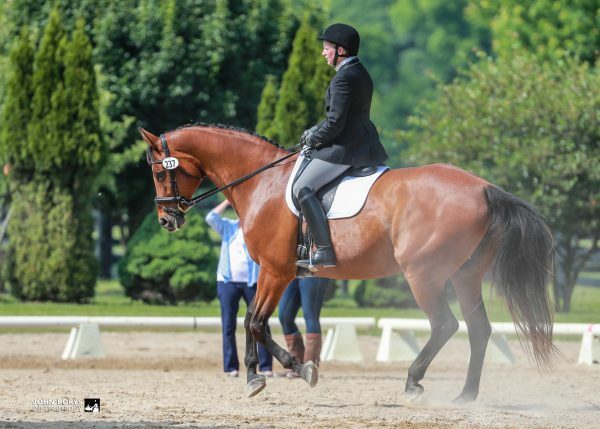 We got a 71.9% at our second show in June, where I scored 8.0 on Rider’s Position and Seat and the judge awarded us an 8.0 on the elusive transition from trot to left lead canter! Show number three in September resulted in a 68.9% with an 8.0 for the equally problematic transition from left lead canter to trot. Feeling more confident, we will spend the winter preparing for First Level next year, as well as attempt to jump in the sidesaddle! I am a Side Saddle Instructor. It is a lovely discipline. I am glad you have joined!! What a wonderful account of your Aside adventures. Congratulations on all of your successes. 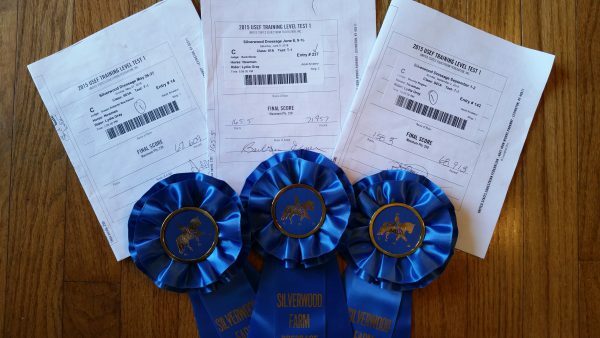 I encourage you to earn the USDF bronze and silver medal scores aside. Only two other people have earned these bronze medal scores and only one the silver. Go for it!! !